Welcome to our February 2019 Greek Isles Blog Hop! Our theme for this month is Sale a Bration and the Occasions Catalog. After scouring Pinterest for all kinds of beautiful pictures of Greece for my Greek Isles Trip planning board I settled on a color scheme of Blue, White, and Green. Then I chose to the Golden Afternoon stamp set. which I feel is a real hidden gem in the Stampin' Up! Occasions Catalog. In case you missed it - it's on page 31. 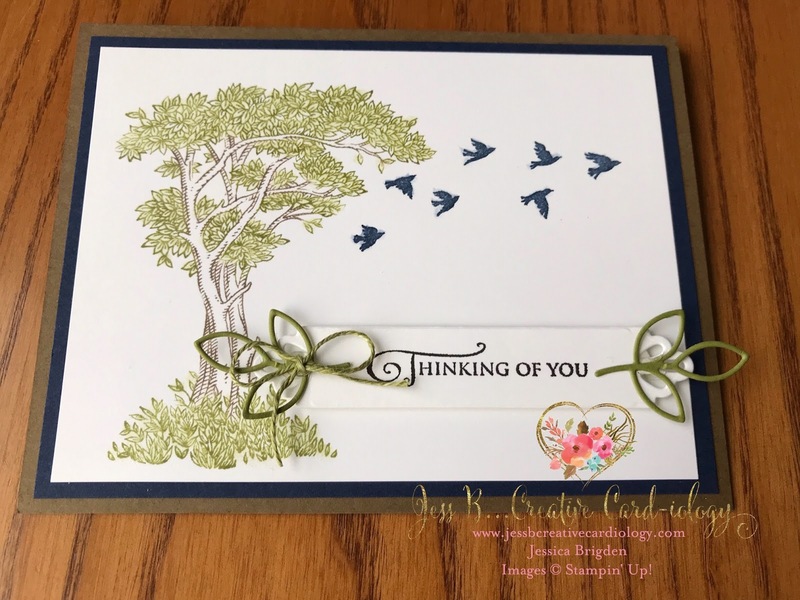 It's very simple but I love the script font used for the many beautiful sentiments. I thought the large tree image vaguely resembled an olive tree so I decided to use that as my focal image. 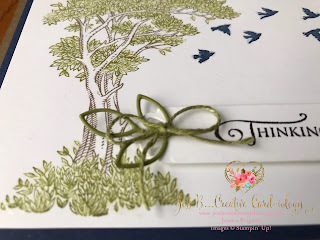 I colored directly on the tree stamp with my Old Olive and Soft Suede Stampin' Write Markers, and stamped the flock of birds in Night of Navy ink. I thought it looked a little stark so I used my Wink of Stella clear glitter brush to paint the leaves and the birds. The Stella help blend the ink a bit so the trees have a more painted look., and softens the image of the whole card. I stamped the sentiment on a label cut from one of my favorite new sets of framelits - the Needlepoint Elements and popped it up on dimensionals. Then I die cut little olive leaves from the same Needlepoint Elements framelits and adhered them to the card with mini glue dots. I added a little bow tied with Old Olive Linen Thread to add the finishing touch. I hope you've enjoyed the little creative escape to Greece I envisioned creating with my card! And thank you for joining our trip achievers blog hop. I know you will be equally inspired by what the others have to share. You are currently at my blog, www.jessbcreativecardiology.com. Check the list below to see who is up next!